John Lahey is Quinnipiac University’s longest standing president. In 2014 he was the second-highest paid in the country, making over $3.7 million a year, according to an article from Business Insider. However in a few short weeks the reign of Lahey will end and Judy Olian will take over. As the university’s first female president, Olian will be making history. But Lahey already has. For the last 31 years Lahey has expanded the physical campus and increased the population. But he’s also dealt with the consequences of that growth. When the university hired Lahey as president in 1987, Russia was still called the Soviet Union. Ronald Reagan was president. Walk Like an Egyptian was the number one song. And the quad on Quinnipiac’s main campus didn’t even exist. According to an article from Quinnipiac Magazine, Lahey was the one who first envisioned the current “quad.” Prior to 1987 it actually resembled more of an “L,” with just the library and a classroom building to the left. Slide the white line back and forth to see changes from QU in 1991 to QU in 2017. Notice that while the school had built Echlin by 1991, it hadn't built Center for Communications and Engineering, and it has also expanded the dorms since then. Also, York Hill was still just a hill back in '91. But all this expansion came as a result of the growing enrollment. The university needed somewhere to put the students they were admitting. The graph above shows growth rates for Quinnipiac and Hamden over 30 years, according to Hamden's website, the Quinnipiac registrar and Quinnipiac’s annual reports, which are on file in the library (photos of select pages are available here). In all but seven of those years, QU’s growth rate exceeded Hamden’s. The school’s enrollment dropped only one year, but Hamden’s population dropped or stayed virtually the same about half of the three decades. And although reasons for an increase in enrollment aren’t definite, some peaks in growth rates happened around the same time as university expansions. For example, according to Quinnipiac Magazine, the university opened the law school in 1995. The next year there was a small spike in enrollment rate. Also, after President Lahey’s 2006 agreement with the town of Hamden to offer housing for all students on campus, the University saw its first negative growth rate in years in 2007. Quinnipiac had not yet built the York Hill dorms; the expansion had only been approved in 2006. By the time the dorms were finished in 2010, the university had the highest growth rate in a decade. However, with this growth came tension, as more young adults opted to live in off-campus housing in the surrounding town. And in recent years, students having parties in off-campus housing have caused some conflicts between the town of Hamden and Quinnipiac. Although the university does offer housing for students for all four years, President Lahey said it’s unrealistic to expect all students to choose that option. "If we'd built 500 more beds, more students would have come on campus, but there would still be the 20 percent who wouldn't. It wouldn't solve the problem, and we'd have hundreds of empty beds," said Lahey in an interview with the Hartford Courant in 2015. Since 2015 total enrollment has increased by close to 1,000 students. To keep the peace with the town, QU plans to expand housing. On March 27, the Hamden Planning and Zoning Commission approved Quinnipiac’s plan to build senior housing on York Hill, including over 200 more beds. But it’s only a few problem houses a year that hurt the university’s relationship with the town. During the most recent school year eight noise complaints came from homes that had permits to rent to students, according to records from the Hamden Police Department (there may be landlords that rent to students without permits). However there were close to 300 noise complaints over the same amount of time, spread across the entire town. The black icons are addresses of noise complaints filed with the Hamden Police Department. The purple dots are addresses that have permits to rent to students. It should be noted that there may be some homes that do not have a permit to rent to student, but students may still live in some of the homes that are close to the Quinnipiac campus. So despite the growth of Quinnipiac during the Lahey years, his tenure hasn’t been perfect. In 2015 Lahey attended an off campus party during “May Weekend,” a notorious party weekend at QU. In an attempt to “be humorous” with the students, Lahey celebrated their May Weekend party, and his remarks enraged some Hamden residents and Quinnipiac alums. “I deeply regret having made these remarks, for which I sincerely apologize. I have already personally conveyed this apology to Interim Mayor Jim Pascarella and renewed my commitment to work with him and town officials to resolve these long standing student housing issues in the immediate future,” Lahey said in a statement in 2015. But just in time for his retirement, Lahey seems to be easing tensions. In a 2017 press conference, Lahey presented Hamden Mayor Curt Leng with a $1.4 million check. The money will support the arts and culture programs in Hamden, according to Leng. “Quinnipiac and the town are on better footing right now than we have been in a very long time, and that is a great benefit to the university and to the town,” Leng said at the press conference. Perhaps the goal of mending university-town relations is the reason for the increase in tuition. While the average student doesn’t pay the current full tuition of over $60,000, according to annual reports, the amount has increased by over 200 percent over the last three decades. Adjusted for inflation, in 1988 the average student paid almost $12,000. The most recent year available showed that an average student pays about $40,000. And the university’s revenue increase isn’t just from tuition. Between 1988 and 2017 revenue from everything but tuition (including gifts, grants, and investment returns) increased nearly 400 percent, after adjusting for inflation. But the distribution of that money hasn’t changed much over the years. The biggest difference in the expense data over the past 30 years was in student aid and scholarships, and sponsored research. In 1988 less than a quarter of Quinnipiac’s expenses went to student aid and scholarships, but by 2017 it was close to a third. 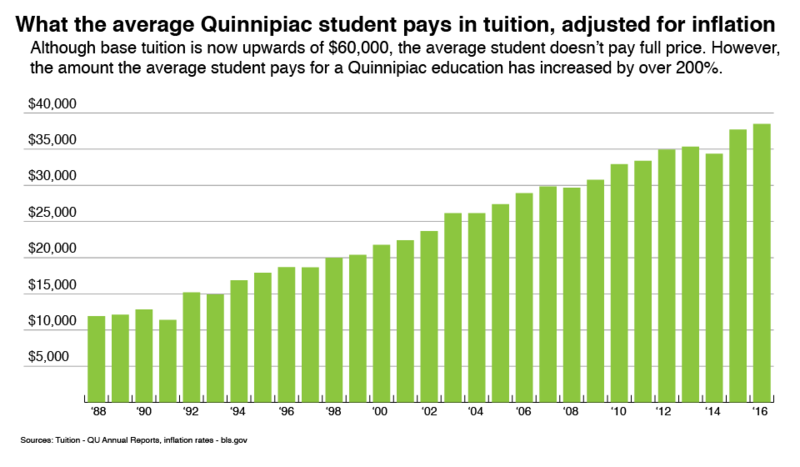 By increasing student aid, the university can increase enrollment and give opportunities for students who may not have been able to afford Quinnipiac’s hefty tuition. While Lahey’s departure has left students wondering how life at Quinnipiac will change under a new president, Lahey has his own plans. He plans to spend the colder months in Florida with his wife, Judy. But Lahey does plan to come back and teach a philosophy or logic course in spring of 2019, according to an interview with The Chronicle. “I hope, I’m leaving Quinnipiac as someone who doesn’t take themself any more seriously than they have to and appreciates the people around them,” Lahey said.